EuroGIGA CRP “Spatial Decompositions and Graphs” (VORONOI) IP1: ADVANCED VORONOI AND DELAUNAY STRUCTURES Franz Aurenhammer IGI TU Graz Austria. 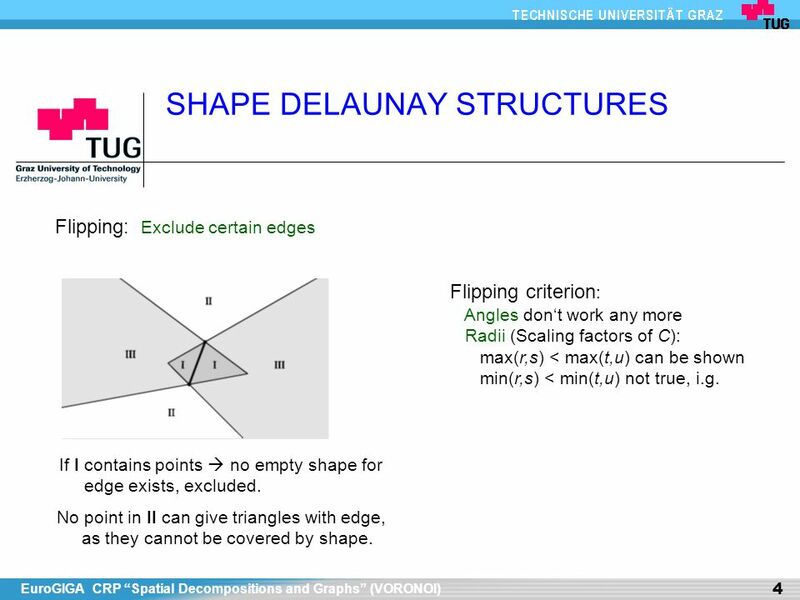 5 EuroGIGA CRP “Spatial Decompositions and Graphs” (VORONOI) 4 SHAPE DELAUNAY STRUCTURES Flipping: Exclude certain edges Flipping criterion : Angles don‘t work any more Radii (Scaling factors of C): max(r,s) < max(t,u) can be shown min(r,s) < min(t,u) not true, i.g. If I contains points  no empty shape for edge exists, excluded. No point in II can give triangles with edge, as they cannot be covered by shape. 7 EuroGIGA CRP “Spatial Decompositions and Graphs” (VORONOI) 6 SHAPE DELAUNAY STRUCTURES Open questions: -- More optimization properties (Flip: r+s < t+u ?) -- Number of flips, given C ? -- Deciding whether T is some shape Delaunay (find C) Characterization of DT(C)... -- Is the number of shape Delaunays polynomial for every point set? 12 EuroGIGA CRP “Spatial Decompositions and Graphs” (VORONOI) 11 ZONE DIAGRAMS Polynomial root finding Set of n points in the plane...interpreted as the roots of a complex polynomial of degree n Root finding: Initial value z 0, iterative method. Convergence to some root z i = point location, yielding site p i  Basin of attraction for each site Seqence of iteration functions B m [Kalantari] B 2 = Newton‘s method, B 3 = Halley‘s method Fractal behavior... Uniform approximation of Voronoi diagram, as m grows. 14 EuroGIGA CRP “Spatial Decompositions and Graphs” (VORONOI) 13 ZONE DIAGRAMS Open questions More insight into the structure of zone diagrams Construction algorithms, approximation... Is there a link to basins of attraction? 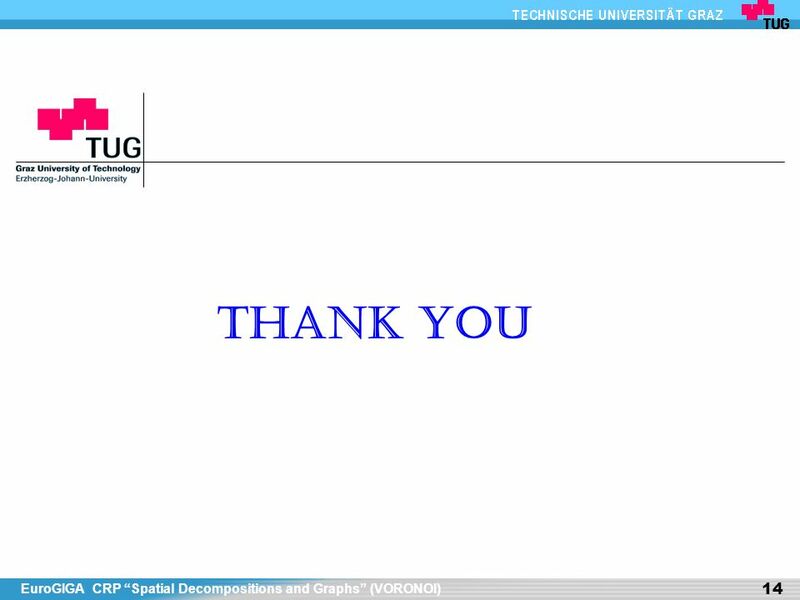 Download ppt "EuroGIGA CRP “Spatial Decompositions and Graphs” (VORONOI) IP1: ADVANCED VORONOI AND DELAUNAY STRUCTURES Franz Aurenhammer IGI TU Graz Austria." Alpha Shapes. Used for Shape Modelling Creates shapes out of point sets Gives a hierarchy of shapes. Has been used for detecting pockets in proteins. 1 st Meeting, Industrial Geometry, 2005 Approximating Solids by Balls (in collaboration with subproject: "Applications of Higher Geometrics") Bernhard. Comments We consider in this topic a large class of related problems that deal with proximity of points in the plane. We will: 1.Define some proximity.  Distance Problems: › Post Office Problem › Nearest Neighbors and Closest Pair › Largest Empty and Smallest Enclosing Circle  Sub graphs of Delaunay. KIM TAEHO PARK YOUNGMIN.  Curve Reconstruction problem. Computational Geometry II Brian Chen Rice University Computer Science. Course Syllabus 1.Color 2.Camera models, camera calibration 3.Advanced image pre-processing Line detection Corner detection Maximally stable extremal regions. By Groysman Maxim. Let S be a set of sites in the plane. Each point in the plane is influenced by each point of S. We would like to decompose the plane. The Voronoi diagram of convex objects in the plane Menelaos Karavelas & Mariette Yvinec Dagsthul Workshop, march 2003. 3/5/15CMPS 3130/6130 Computational Geometry1 CMPS 3130/6130 Computational Geometry Spring 2015 Delaunay Triangulations II Carola Wenk Based on: Computational. 1st Meeting Industrial Geometry Computational Geometry ---- Some Basic Structures 1st IG-Meeting. Computing Medial Axis and Curve Skeleton from Voronoi Diagrams Tamal K. Dey Department of Computer Science and Engineering The Ohio State University Joint. Generalized β-skeletons GABRIELA MAJEWSKA INSTITUTE OF INFORMATICS UNIVERSITY OF WARSAW POLAND MIROSŁAW KOWALUK INSTITUTE OF INFORMATICS UNIVERSITY OF. CSCE 620: Open Problem Voronoi Diagram of Moving Points Asish Ghoshal Problem 2 from The Open Problems Project 1.